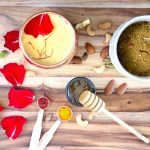 Powdered nuts and spice blend has been an ancient Indian recipe for ages. Most traditional Indian households have seen this blend added to their morning or night time glass of milk. In today’s world, the scientific research has proven that nuts are a vital part of a healthy diet. Nuts contain a unique combination of healthy fats plus a range of vitamins, minerals and phytochemicals which helps nuts reduce heart disease and Type 2 diabetes risk, lower cholesterol and manage weight. Turmeric has also been used in Indian food and beverages for its medicinal qualities since millennia. Whether to combat a cold or insomnia, act as a mood enhancer or an anti-inflammatory, turmeric’s incredible properties have seen it go from every Indian mother’s preventive medicine strategy, to being the key ingredient in 2016’s most popular food trend – the turmeric latte. Move over, turmeric latte! Hello, Masala Latte! We decided it made no sense to wait another 5,000 years to share an even more nutritious and far more delicious (yes, I said it!) 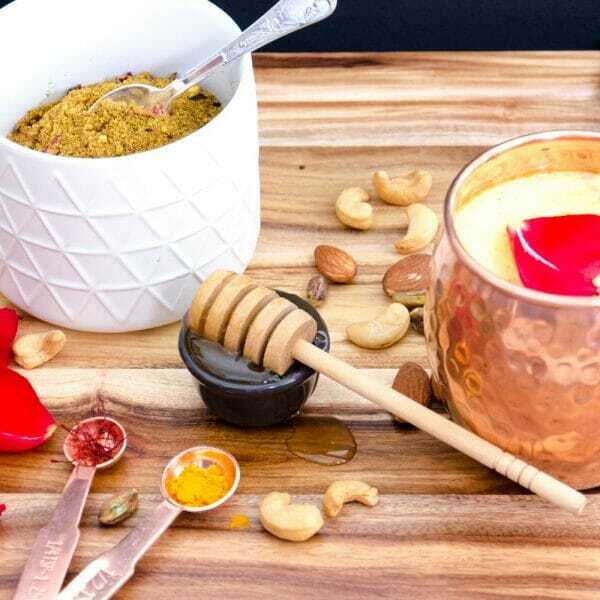 ancient Indian miracle drink – masala doodh. Simply translating to ‘spiced milk’ or ‘spiced latte’ this delicious drink provides warmth, immunity and sustained energy. 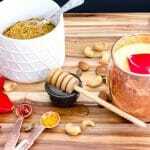 It is made by infusing warm or chilled milk with a mixture of hand roasted nuts, laced with turmeric, saffron and select spices. But don’t just take our word on this, go on and try the Masala Brew for yourself. Brace yourself to be embraced by scent of big bouquet of roses the moment you open the packet. Nutty overtones hit your senses the next, with a hint of spices in the background. We think Cleopatra was on to something while taking those milk baths! 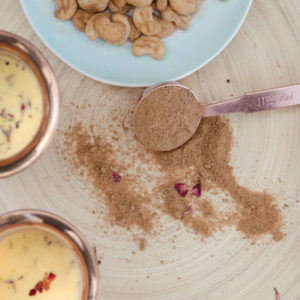 The simmering pot of this golden milk, wraps you in a heady floral aroma mixed with cream and gives your humble kitchen an exotic vibe as if you have walked in a day spa! Rich golden-brown powder with specs of vibrant greens lent by pistachios and eye catching dry rose petals. Golden yellow. 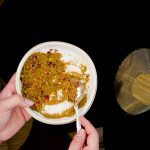 You might just share that vision of Cleopatra’s, as your senses get engaged in this little concoction, right while it is brewing away in the pot. The gentle boiling of the milk starts to ooze out the golden colour of the turmeric. As the milk heats up further, the saffron threads impart its golden orange colour and sweet flavour to the brew. Nutty, crunchy, smooth and creamy, all adjectives can describe this brew. Depends on what you like. The overarching flavour is almond, cashew and pistachio that dominate the mouthfeel. The hints of cinnamon, cardamom, nutmeg and turmeric emerge at the back of the palate. While saffron and rose petals leave a lingering aroma and tiniest hint of floral sweetness. The scent of rose petals and saffron dominate the cup from the moment you take your first sip of this Masala Latte. The almond and cashew meal give body to the milk making it even more creamier, smooth and rich. The intricate spices play a gentle harp at the back of the palate while your taste buds are in a tizzy, wondering what just hit them. One teaspoon of jaggery added to this masala latte takes it on another level of taste sensation as the jaggery lends its gentle caramelly sweetness to the brew while enhancing the flavours of the nuts and spices. A must try! Add this to flavour milk of your choice. (Masala Latte). We recommend using Soy milk to create your masala latte. (Be warned: it is addictive!). 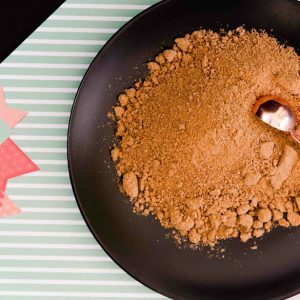 Sprinkle on porridge, Weet-Bix, pancakes or French toasts. Add to desserts, cakes or gluten free foods. Be creative! (let us know how you used this fab Masala Brew and we will try it too). Sleep time soothing drink for tiny tots. After school snack/drink for the youngsters. This is just splendid. My one-year old has got addicted to the Masala Brew. I added it to his semolina and Milletporridge as he had gotten a bit bored of them in their simple form; and with Masala Brew added to it he attacked it badly and polished off the whole bowl full. Definitely need more of this stuff. I have masala milk every night before bed and I sleep like a baby! Really nice. Love the rose petal and pistachio infused taste. This Masala Brew creates a perfectly aromatic, flavourful and energising Masala Latte. I add Masala Brew to a glass of milk every morning for my son who is fussiest of eaters. He loves drinking the milk now to my relief and saves me time in the morning rush hour! The Masala Brew is so versatile, I added it to a Bolognese sauce and it gave it a huge flavour lift. It is always a challenge for mums to get their kids to drink healthy options which turn out to be bland and flavourless. Finally, my son happily started drinking Masala Brew flavoured almond milk. What a relief! Just loved it. 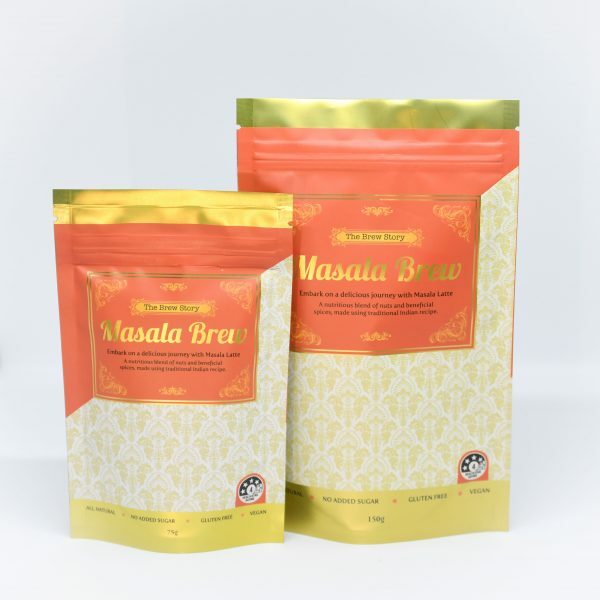 Keep your kids happy and health with Masala Brew. Would definitely order more for my family and my patients.